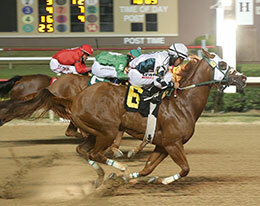 Mia Kine(#6) holds off fellow qualifier Ja Big Bad Gol in the fourth trial Friday night at Lone Star Park. GRAND PRAIRIE, TX�SEPTEMBER 15, 2017�Ten qualifiers are set and will meet in the 20th Running of the Grade 3, $214,200 Dash for Cash Derby at 440 yards to be run on Saturday, September 30 at Lone Star Park. Mia Kine, a daughter of multiple stakes sire DOMINYUN, posted the third fastest time when she defeated Ja Big Bad Gol by a neck in the sixth trial. Trained by Rolando Almanza, Mia Kine races for Elite Oilfield Services. Bred in Oklahoma by Vaughn and Jill Cook, Mia Kine entered the Dash For Cash Derby trials off a troubled off-the-board finish in the Speedhorse Derby on July 29. Ridden by jockey Jesse Levario the sorrel filly clocked the 440 yards in a :21.915 seconds to post the third fastest time. Also a finalist in the Grade 1 Heritage Place Futurity at Remington Park last season, Mia Kine has earned $38,716. For the official list of qualifiers for the 2017 Grade 3, Dash for Cash Derby, including times, sires, dams, owners, breeders, trainers and jockeys CLICK HERE.